Here, Oliver Hart and Luigi Zingales offer their vision of how to improve the Dodd-Frank financial deform bill known as The Wall Street Reform and Consumer Protection Act . I suspect that most people who aren't directly involved in the financial services industry or the banking industry have very little knowledge about what the 2,000 page Dodd-Frank bill made federal law. As Hart and Zingales note, "The Fed can now unilaterally decide that any financial institution is “systemically important”—meaning that its failure could destabilize the financial system itself—and impose any sort of regulation on it, such as requiring that it hold more equity capital, limiting the amount of short-term debt it can issue, forcing it to write up a living will, and so on." The bill further entrenches power in the Fed to manipulate financial markets, as if the Fed didn't already have that power. But this aspect is but one of the troubling features of the Dodd-Frank financial deform bill. The bill also sets up a complete czar who is empowered to dictate rules about consumer credit. In the end, the financial deform bill further codifies control over financial markets in the hands of the few and the powerful. It is utterly exasperating that the Dodd-Frank financial deform bill did nothing to address a very real problem --- the so-called "too big to fail" problem and future taxpayer bailouts the federal government will doubtlessly impose whenever the few and the powerful are threatened with loss of wealth. Of course, the official mantra that we are all supposed to believe is that banks and other companies in the financial industry must not be allowed to fail, because of their "interconnectedness." The notion is that If ABC bank fails, and if ABC bank owes XYZ bank money, the failure of ABC bank could also bring down XYZ bank. Implicit in this "contagion" domino theory of financial markets is that for some reason, XYZ bank should not suffer risk of failure. In other words, XYZ bank should be empowered to hold risky financial securities issued by ABC bank with impunity. Instead, you and I should bear the risk of loss while XYZ bank just enjoys the profits if ABC bank does not not fail. But why should XYZ be sheltered from risk in the first place? Why shouldn't it be up to XYZ bank to manage its risk of purchasing financial securities issued by ABC bank? Moreover, what is never said by the Fed and Congress is the simple fact that even if both ABC bank and XYZ bank fail, the nation has hundreds of banks that manage risk properly who will not fail. Those banks didn't buy ABC bank's securities in the first place --- precisely because they were such risky assets. The contagion theory of financial markets is a fraud perpetrated by the few and powerful upon the masses of we the people. The failure of even very large banks would not destroy our economy. We have bankruptcy laws. Financial markets are far too robust for that outcome. But failure of large banks and other financial institutions could wipe out substantial wealth of the few and powerful. That's why Congress created the Fed in the first place, at the behest of the few and the powerful in 1913. Learn more about it here (video) or here (print). 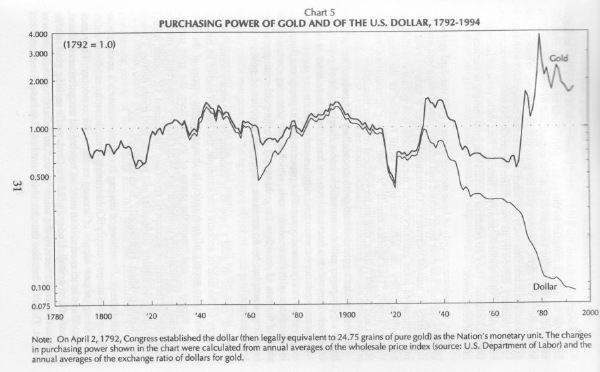 Since 1913 Congress has protected the few and the powerful who operate in financial markets. You and I can lose our money investing in financial securities, but not the few and the powerful. It's not that they are too big to fail; it's that they are too powerful to fail. Goldman Sachs comes to mind. But quite obviously, Lehman Brothers was neither too big nor too powerful to fail. Too bad for Lehman Brothers. Martha Stewart suffered a similar fate. She also isn't part of the few and the powerful. How could Congress improve the Dodd-Frank financial deform bill? Repeal it entirely. Financial businesses, including banks, would function just just fine, if they were restrained by to the discipline of competition and the very real possibility of financial loss if and when they perform badly. If regulation works so well to bring us stability in financial markets, how is it that we got Bernie Madhoff and AIG? How is it that we got Fannie Mae and Freddie Mac? How is it that we got the S&L crises of the 1980s and 1990s? How is it that we got the Great Recession, a recession that is widely understood to be the direct result of Congress and the Fed? Are we too far gone to recover our liberty from the few and the powerful? We the people made a start in November 2010. Will we continue with further progress in 2012? You and I will decide; joining the New Blood Party would be a great way to keep the momentum going. Here, Marcus Walker and Matthew Karnitschnig write in the WSJ about continuing debt problems in Europe. And what of Ireland now going the way of Greece? What of the EU and all it's bailout debates? Will Portugal and Spain be quick on the heels of Ireland? You betcha. It appears that financial ministers and political leaders around the globe have simply lost touch with reality. How is it that lending yet more money to a group of people who have already borrowed beyond their own willingness and ability to produce real goods and services will help? Money is just money. You can't eat it, wear it, live in it, heal yourself with it, or ride around in it. It's just money. Until the Europeans understand that money is not real goods and services --- a really simple point --- no amount of bailout funds from the European Financial Stability Fund or the International Monetary Fund will make any real difference. Bailouts postpone and transfer. Bailouts postpone a reckoning with reality. And bailouts transfer losses from the non productive to the productive, from producers to looters. We should know here in America. Our political leaders did the same thing with General Motors. BHO and crew are all puffy about the chest just now, claiming that bailing out GM was clearly the right thing to do. Jobs were saved. GM is back on its feet. GM turned a profit this quarter. Toyota has been vanquished by trumped up allegations of accelerator problems. Never mind that the evidence didn't support the allegations. People who don't produce goods and services that are valuable to other people just aren't going to be able to borrow their way to prosperity. To prosper, humans must produce real stuff, using natural resources, their own labor, plus plant and equipment conceived and designed by good thinking, and financed by real saving --- that is, abstinence from consumption. Why is it that political leaders and their central banks think that money is the issue? Real production of real goods and services is the issue. Financial bailouts won't help because it really isn't about the money. The PIGS will turn it around if and when the people who live in Portugal, Ireland, Greece, and Spain understand that producing, not borrowing, is the way to prosperity. You can't borrow what hasn't yet been produced. Study the nearby graph. Any obvious conclusion jump out at you? Students of history will recall events of 1913 and 1971. In 1913, Congress created the Creature from Jekyll Island --- the Fed. In 1971, President Nixon ended American subscription to the Bretton Woods gold standard system. Probably just a coincidence, right? BHO's deficit commission is costing tax payers money, but what they will eventually come up with will be pointless. That's because it is certain that the commission will recommend raising taxes. Here, Stephen Moore and Richard Vedder provide historical data about deficit reduction and tax policy. History shows clearly that raising taxes leads Congress to spend more. In fact, every dollar of increased taxes results in more than a dollar of increased federal spending. Wrong direction for the deficit and accumulated federal debt, wouldn't you say? The deficit problem is a federal spending problem. The deficit problem won't be solved by raising taxes. Want to reduce the annual federal deficit, and OMG, the accumulated federal debt? Join the New Blood Party. Get rid of the politicians who voted for all the red ink in the first place. Austrian School or Keynesian School? A good friend sent this video along to me. Better keep your eye on Peter Schiff if you really want to understand economics. Better fire Helicopter Ben and all the other bozos who pass for smart economists. Better fire the president who reappointed Ben, too. Here, Nat Hentoff laments that so few people understand the First Amendment to the Constitution, which is of course, the opening restriction on the federal government in the Bill of Rights. Certainly, Hentoff is correct to decry this sorry state of affairs in America. But I will go Mr. Hentoff one better. Evidently, the President, Congress, and the Supreme Court are ignorant of the Ninth and Tenth Amendments to the U.S. Constitution. Important as the First Amendment is, the Ninth and the Tenth Amendments are more important, still. Either the President, Congress, and the Supreme Court are ignorant of the Ninth and Tenth Amendments, or they are choose to break the supreme law of the land. Judge for yourself. Now, maybe my reading skills are just deficient. But by my read, the Ninth and Tenth Amendments bar the federal government from doing to the people and the states about 90 percent of what we are pleased to call federal law (i.e., the U.S. Code). Like Hentoff, I wish people knew about the First Amendment, certainly. But I wish even more that the President, Congress and the Supreme Court would uphold the Ninth and the Tenth Amendments. What does the Bill of Rights have to do with economics, you ask? Isn't this blog supposed to be about economics? Yes, this blog is all about economics. Sad to say, much of what is called the U.S. Code is federal law that grants certain parties economic advantage over others or denies all citizens the right to engage freely in voluntary exchange --- which is the only engine of economic prosperity. Through voluntary exchange, America became the best place on the planet to live and thrive. Yet, the continuing, ceaseless work of the federal government (the 545) to restrict voluntary exchange and control all we do will cause the noble experiment called America to fail in the end --- if we the people allow it. A people can have no more important liberty than the right to engage with each other in voluntary exchange. The Ninth and the Tenth Amendment are part of the supreme law of the land. Shouldn't we insist that the President, Congress, and the Supreme Court obey the law? The Federal Reserve will require all 19 banks that underwent stress tests during the height of the financial crisis to undergo another review of their capital and their ability to absorb losses under an "adverse" economic scenario. The Fed, in guidance issued today, said all 19 banks must submit capital plans by early next year showing their ability to absorb losses under a set of conditions to be determined by the central bank. The request is part of the Fed’s effort to step up supervision at the nation’s largest financial firms. I really, really thought Greg Mankiw was smarter than this. In fact, I know he is smarter than what he has to say about so-called quantitative easing (QE2). So that leads to a sad conclusion; Mankiw thinks it's okay for the Fed to monkey around with interest rates. Check out this video for a complete explanation of QE2 in plain English. Interest rates are prices. Prices provide vital information to people about value. When government distorts prices, bad things happen. Mankiw knows that, but evidently chooses to ignore what he knows when it comes to money and interest rates and the Fed. I don't use marijuana. I don't use it because I don't like it. But I would support your right to use marijuana if you want to, just the same. Fortunately, my drug of choice (scotch) has been legal since repeal of prohibition in 1919. California's Proposition 19, which would have legalized recreational use of marijuana, went down in the recent election. Here, Mark Thorton explains the economics of the whole deal. Make no mistake about it; the economics of the deal prevailed, as they always do. Shame that more folks don't understand more about economics, really. At least not forgotten by Alan Blinder. Never mind that Keynesian ideas have pretty much been debunked in theory and utterly refuted empirically over and over again. Here, professor Blinder, a well known economists and a former Vice-Chairman of the Federal Reserve, takes Sarah Palin to task, of all people. I guess professor Blinder didn't see this open letter to Ben Bernanke signed by several prominent economists who know a bit more about macroeconomics than Sarah. Beating up in the WSJ on Sarah Palin and German Finance Minister Wolfgang Schauble is just a bit juvenile, don't you think, professor Blinder? Why not take on the genuine economic arguments of your peers instead? Professor Blinder wants to keep reminding us of what he learned in ECON 101. I want to remind Blinder of what he evidently has forgotten that he should have learned in ECON 101. Lesson #1: You Can't Borrow What Hasn't Already Been Produced. Creating a bunch of new money, which provides for a bunch of new credit-financed spending by the U.S. Treasury is an ill-fated attempt to borrow what hasn't yet been produced. For readers who have forgotten why NO ONE, including the U.S. Treasury can borrow what hasn't yet been produced, here's a refresher. Blinder seems to think the only problem with QE2 is the potential for inflation, which pumping $600 billion of new money into the economy definitely creates --- a fact that Blinder acknowledges. But increased inflation isn't the worst part of the problem. Much worse is giving the U.S. Treasury $600 billion to spend without taxing American citizens. Why in the world would we want the U.S. Treasury to spend $600 billion under the direction of Congress instead of American citizens and businesses doing the spending? Just in case you haven't been paying attention, Congress doesn't spend your money the same way you would. Congress thinks it's Robin Hood. You probably don't think you're Robin Hood. By the way, Blinder thinks that 2 or 3 percent inflation is "normal." I guess if history is the only guide, then yes, a steady diet of inflation from the Fed is quite "normal," based on the 98-year history of the Fed's bungling. But what Blinder doesn't mention is that with just 2 percent inflation per year, after 10 years every dollar in existence will have lost almost 20 percent of its purchasing power. 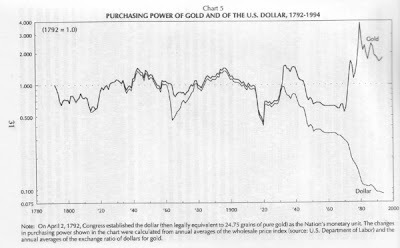 Where does the lost purchasing power go? It goes straight to the U.S. Treasury. The federal government loves inflation. Does it surprise you that its right arm, the Federal Reserve, loves inflation, too? Professor Blinder, your bias and political stripes are definitely showing. Please go back to real ECON 101 basics and tell it like it really is, instead of the way the Fed and BHO want it told. Wouldn't it be nice if we had a president who understood at least a little economics? We don't now, but we can always hope for the future. Read here about how BHO has failed to reach agreements with the president of South Korea about how America and South Korea could trade. What's to agree on? All you have to do is let people voluntarily do what people want to do voluntarily. The power of voluntary exchange to bring prosperity and harmony to people is really quite remarkable. I wish BHO and crew understood that very simple principle, but it just isn't the case. One can easily guess the kinds of trade "deals" BHO was auguring for. We get this, you get that, and mostly the folks at home get screwed, except of course, the folks who have given BHO money to get elected in the first place. Sadly, that's the extent of deliberations between the presidents of nations when it comes to international trade. Milton Friedman probably said it long ago, since he said so many things about economics that were absolutely brilliant. Never mind if some other country wants to impose trade restrictions of some kind. Trade with them freely anyway, as businesses voluntarily decide to do, just the same. Why? Because it will make everyone involved better off. In other words, there is no such thing as a voluntary exchange that doesn't produce value for both parties to the exchange. This principle really isn't hard to understand. If two parties --- be they individual persons or companies --- voluntarily agree to trade, it must be that each will be better off. If that were not the case, they wouldn't agree to the exchange voluntarily. Uh, duh. Of course, if you are a president of a country, and if some particular fat cats in some particular industry gave you lots of money to get elected, then you are obliged to try to get unusually good terms of trade for the fat cats in that industry --- even if it hurts everyone else but the fat cats in that particular industry. Never mind the millions of ordinary people who aren't part of that particular industry who would otherwise benefit from open and free trade. All this has been well understood for decades by modestly intelligent people. The economics of free trade among people and businesses around the globe is completely and utterly well known to every economist on the globe. But never mind that a vast majority of economists agree that unfettered free trade produces prosperity for all involved. Politicians still want to play the "trade game." What's the trade game? That's the game where politicians of one country --- say America --- attempt to restrict imports of certain goods and services --- say Korean manufactured cars --- and at the same time try to enhance possibilities of exporting certain other goods and services --- say beef --- to buyers in another country --- say Korea. Morons. Just let people and businesses decide what they want to trade. Get BHO and crew out of it. Oh, by the way; I think the American people are getting about the business of getting BHO and crew out of it. Can't wait for 2012 elections. Just in case you have been worrying about sustainable growth in the U.S. economy, check this out. People who call for conservation of energy and other natural resources evidently have a really constricted view of nature. Sad, really. If you are interested in uncommon wisdom and rock-solid economic analysis about growth and recovery for the U.S. economy, read this. Wow. One has to guess that Kevin W. Warsh, a member of the Board of Governors of the Federal Reserve is not particularly popular with Helicopter Ben and the rest of the Fed just now. Here, Mr. Warsh explains the errors of the Fed's recent policy choices. As I have said way too many times in this space, Federal Reserve policy is a huge part of the problem with our economy. It is gratifying to see that at least one of the members of the Fed Board agrees. John Cochrane is a really, really smart economist. Here, (here for pdf) he explains why recent pronouncements at the G-20 meetings from our Tax-Cheat-In-Chief, Timothy Geithner, are amazingly idiotic. In an earlier EconoBlast post (here), I explained why blaming the Chinese is pretty much just a diversionary tactic. I also observed here that Geithner is not to be taken seriously. Yet, after all, he does have a duty to be a team player for BHO and crew, right? It is disappointing, though, that a well-trained economist like Geithner can't find it within himself to speak the economic truth. Never mind. We do have John Cochrane to help us out. What Will the Next Bubble Be? Bubbles are tricky business. But Helicopter Ben's leadership of the Fed will definitely fuel one somewhere. Read here about one prognosticator's best guess. History is easy to ignore, especially if you're part of the power elite. The article you will find here is a bit of a long read, but it's worth the time. The bottom line: the Fed is not the solution; the Fed is a big part of the problem. Recessions don't just happen. Recessions are not naturally occurring phenomenon like hurricanes. We could be free of anything remotely resembling a "business cycle" if we could be free of the Fed and inept economic policies of our own Congress. Recessions are caused, and some of us know what causes them. EconoBlast has explained it so many times, here for example, that readers must be growing weary of repitition. If you want an expert Austrian economics exposition on the topic, read this article. Let me put it about as simply as it can be put. According to the Fed itself, and the enabling legislation from Congress that established the Federal Reserve System, the Fed is responsible for stabilizing the economy. Is it not utterly obvious that the Fed is incapable of achieving its purpose? Hey, I've got an idea! Let's give the Fed even more power to disrupt financial markets. Oh, excuse me; the Congress just did that. The Tea Party and conservative Republicans are all about repealing ObamaCare just now. Good idea. But at least as important would be repealing the Dodd-Frank financial regulation reform bill. If you have a cancer in your body, you probably want to get it out, instead of feeding it. Read it here. Of course, EconoBlast has been saying this for months. Just the same, it bears repeating over and over an over again. The Federal Reserve unveiled a controversial new plan to buy U.S. Treasurys, hoping to spur growth in a slow U.S. economy. After two days of discussions, Fed officials decided to go ahead with a much anticipated program, saying they will buy $600 billion of U.S. government debt over the next eight months. The Fed's policy-setting body said it stands ready to purchase more bonds if the economy's persistent weakness leads inflation to remain too low and unemployment too high. "Under the label of QE, the Fed will buy long-term government bonds, perhaps one trillion dollars or more, adding an equal amount of cash to the economy and to banks’ excess reserves. Expectation of this has lowered long-term interest rates, depressed the dollar’s international value, bid up the price of commodities and farm land and raised share prices." Read more about his take on it here. I agree with Martin Feldstein. Let's see if we can figure out how the Fed's latest, greatest monetary policy action (a.k.a. "quantitative easing") will affect the economy. When the Fed purchases $600 billion of U.S. Treasurys, it will do so with newly created money. That is, the Fed will write checks to the current owners of those U.S. Treasurys to pay for them, and the current owners of those U.S. Treasurys will deposit those checks in their bank accounts. The Fed will add those U.S. Treasurys to its massive portfolio of federal government debt. Bottom line: the Fed will create $600 billion in new money. Incidentally, the Fed's purchase of $600 billion will create room for the U.S. Treasury to create and sell new U.S. Treasurys. In other words, the U.S. Treasury will attempt to borrow what has not yet been produced. You can read here and here about how well that works out. Any new production of goods and services so far? No. Any new jobs created so far? No. Fortunately, that's not the end of the story. If it were, everyone would surely understand that the Fed's policy will not help America shed its slow growth shackles nor help create new jobs. But the story is complicated enough that the wool can be pulled over our misplaced trusting eyes. The Fed's been doing it for at least 98 years. Next step. What will the previous owners of those U.S. Treasurys do with the new money they now have? By the way, those previous owners could be lots of different folks. They could be you or me, they could be some bank, they could be some Chinese bank, they could be some business, and they could even be the U.S. Treasury itself. They could be anyone at all who happens to own a U.S. Treasury of the maturity the Fed decides to buy. Consider the possibilities for what the previous owners can do with the new money: (1) buy some real goods or services, (2) keep the new money in their bank accounts indefinitely, (3) change their minds and buy newly issued U.S. Treasurys after few days or weeks pass, (4) buy some other financial assets, such as corporate stocks or bonds, or (5) buy some real assets like a plot of land, a vacation home, a rare painting or maybe even gold! Choice (5) appeals to folks who fear the Fed's expansion of the supply of money will ultimately lead to higher inflation. They hope the prices of real assets will protect their wealth. They could be right. But option (5) will not lead to economic growth or new jobs. In fact, choices (2) through (5) do not and will not directly result in new production of goods or services or new jobs created. Option (2) would increase commercial bank reserves, which could lead to banks expanding loans in the fullness of time, which could lead to production of new goods and services --- provided the new loans were made to businesses who want to expand productive capacity and hire more workers. But why would we expect that to happen, since commercial banks already have mountains of excess reserves and could already make all the new loans to businesses they wanted to make --- if only businesses wanted to expand productive capacity and hire more workers. But they don't just now. Why not? They are afraid to expand capacity and increase cost of production in the current political-economic environment. Can you blame them? Of course, banks could extend new loans to households. Presumably, those households would be borrowing to buy real stuff. But how will those households pay back those loans? Consumers who borrow to finance current consumption will need future income to pay back both principal and interest. How will borrowing consumers generate that future income? They would need jobs or their own productive, value-producing business to do so. Consumers who borrow today to finance current consumption are betting on an uncertain future. Lots of households did that during the housing bubble. Those borrowers were not particularly good seers of the future, evidently. Betting on the come is dangerous in poker and in consumption of goods and services, particular when the government is creating massive uncertainty about taxes and its own deficit spending. But new loans made to households who want to spend beyond their means will not generate new production or create new jobs. Remember, we just tried that one; it helped cause the housing bubble, all those foreclosures, and the Great Recession. Incidentally, new loans made to consumers could cause inflation in the prices of consumer goods much sooner instead of later. New money chasing the same quantity of goods and services does lead to rising consumer prices. I guess the Fed doesn't think that will happen. Or maybe the Fed just doesn't really care about that outcome. You decide which is the case. In the fullness of time, options (4) and (5) would cause the prices of financial assets like corporate stocks and bonds, and the prices of real assets like houses, rare paintings, or gold to rise. But the official CPI numbers will not count that as inflation, since the Consumer Price Index does not include such assets in its market basket of goods and services purchased by a typical urban household. Consequently, no increase in inflation (a.k.a., loss in purchasing power of each and every dollar in existence) will be measured by the Department of Commerce. Well, thank goodness; out of sight, out of mind. With no rise in the CPI, the Fed will tell us that the new money it pumped into the economy did not cause a rise in inflation. The Fed will be self satisfied, quite certain in it's collective minds that its policies are not causing inflation. But wait. The story isn't over yet. $600 billion is a lot of new money. Do you suppose that such a huge amount of new money could fuel a bubble somewhere in some asset? No? Think again; that's exactly what happened with housing just a few years back. Remember? All that new money definitely must find a home somewhere. Hey, if you can spot the next bubble before lots of other folks, get in early and get out before the bubble collapses, you can get rich! Every cloud has a ..., you know the rest. Suppose the new money goes for option (5). Since option (5) does not result in new production of real stuff, what do you suppose will happen eventually to the prices of consumption goods and services? Eventually, maybe years from now, the owners of the real assets like houses, rare paintings, or gold may want to purchase cheeseburgers, automobiles, and cloths. When they sell their houses, paintings, or gold to do so, then we could see the prices of cheeseburgers, automobiles, and cloths begin to rise. Then we will see the CPI begin to measure the inflation that actually was present much earlier --- just unmeasured. Of course, by the time consumer prices begin to rise, everyone will have forgotten the quantitative easing the Fed engineered. And if everyone hasn't forgotten, the Fed will assure us that something else is causing the unexpected inflation --- certainly not its ancient policies. Option (3) is a real doozy. Option (3) is a round-about path for the Fed to simply hand new money over to the U.S. Treasury. Does that ever happen? Sad to say, it does. Of course, ANY purchase of U.S. Treasurys by the Fed ultimately finances U.S. Treasury spending, either immediately or later. We might actually be better off if the Fed Open Market Committee exercised its monetary policies through buying and selling a portfolio of houses instead of U.S. Treasurys. At least then it would be builders who prospered when the Fed bought houses, instead of the U.S. Treasury. Of course, if you like the way the U.S Treasury spends its funds, then you will prefer that the Fed buy U.S. Treasurys. When the Fed buys newly issued U.S. Treasurys, it's obvious that the Fed is financing government expenditures with newly created money. When the Fed buys seasoned (i.e., previously issued) U.S. Treasurys, the Fed creates space for issue of new U.S. Treasurys --- expanding federal debt. The world has a large appetite for U.S. Treasurys, especially when the Fed is buying. That leaves us with option (1) for the new money created by the Fed's purchase of $600 billion in U.S. Treasurys. The previous owners of the Treasurys might actually buy real goods and services. That could be a good thing, right? That could lead to increased production and new jobs, right? Yes, it could. But will it? Why would previous owners of U.S. Treasurys decide to buy real goods and services? They could have bought real goods and services before the Fed created $600 billion in new money. All they had to do was sell their U.S. Tresurys and spend the money on real stuff. Why would we think the Fed's creation of $600 billion in new money will motivate someone who owns U.S. Treasurys to buy goods and services, given that they could have done so before, but chose not to? Evidently, Helicopter Ben thinks the previous owners of the U.S. Treasurys will change their saving ways and start spending --- just because the Fed pumps out new money. This story has been a bit long, but if you have read this far, it's time for the punch line. "You can't borrow what hasn't already been produced." The U.S. Treasury can't borrow what hasn't already been produced either. Even if the Fed enables the U.S. Treasury to expand its borrowing by creating new money, that won't likely cause more goods and services to be produced. But the Fed's new money will enable the U.S. Treasury to command a larger share of the U.S. economy. The Fed's new money will enable the federal government to fight its wars. The Fed's new money will take purchasing power out of your pocket and put it into the pocket of the U.S. Treasury. Does the Fed's creation of new money sound something like stealing? Maybe it will make you feel better about it if you just call it "the inflation tax." Or maybe that term will just lead you to think about supporting Tea Party candidates next time around. Here, Fred Barnes explains why the Dems can't blame the economy for their wounds. BHO and crew just over reached. Now the chickens are coming home to roost for a while. Let's see if the Republicans do any better. History isn't really all that promising about that prospect, but we can hope, nonetheless.